Now that Beshert has been launched into the world, I’m at work on a new story. 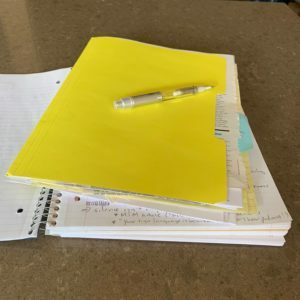 For me, there are distinct stages of novel writing — idea formulation, note taking, outlining, writing, revising and refining. Note taking is my favorite stage, a time when everything I hear, see and read has potential to influence the story. It’s magical. Stay tuned for more news about this work in progress.